With a wrought iron and brass finish, the Bordeaux Chateau Wine Arch from Oenophilia is simply stunning. Hints of the Old French Quarter are throughout this bottle rack to bring your home or establishment to a sophisticated, timeless space. 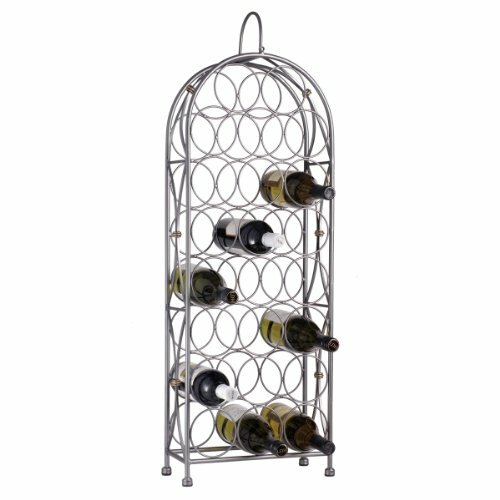 A lovely, swooping handle and four sturdy feet give this piece the exact strength, beauty, and stability to rival any other wine bottle holder. With a capacity of 23 bottles, this item should be hand cleaned to maintain its allure and integrity. This silver rack measures 6” L x 13” W x 36” H.
Wine Racks America Redwood 1 Column 8 Row Display Top Kit. 13 Stains to Choose From!